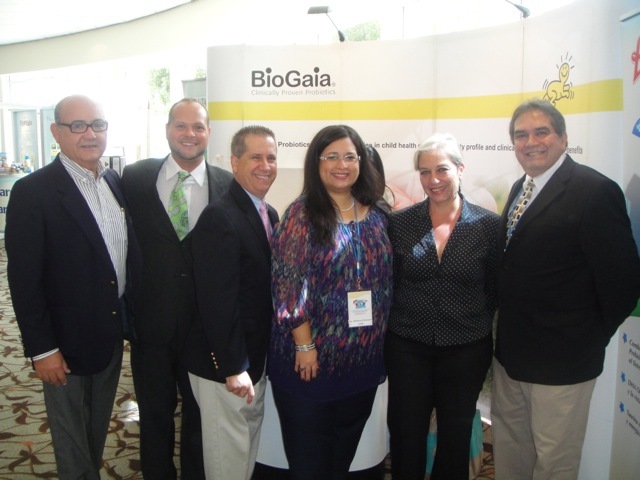 In the beginning of August BioGaia attended the 2do Simposio de la Asociación de Gastroenterología y Hepatología Pediátrica de Puerto Rico and here is a short summary of the success we encountered during the re-launch of the BioGaia brand in Puerto Rico. On Saturday (11/08), Dr. Cruchet was the first speaker at the 2nd Symposium of AGHPPR. There were over 100 attendees present (more than anyone expected — they had to bring in extra chairs). From the participants’ response to the presentation it was evident that they found it very interesting. Some key questions were asked at the end (What did she use for colic? What probiotic did she use for intestinal pain and discomfort in general? ), to which she answered “Lactobacillus reuteri”. Participants started passing by the BioGaia booth to ask about product pricing and availability shortly after the presentation. Several of the symposium participants and some of the other speakers also stayed to speak with Dr. Cruchet after the presentation and the president of the Gastro Peds Association asked if we could bring her back in the future.